I have noticed that they ignore completely what I am saying no matter how I say it, or what I do... I am good at sign language. It drive these three countries crazy and I think nobody ever says hello. I went into this grocery store, held up my ATM or Bank Card and made motions of putting this into the machine. They finally shake their head and say no, I go out and start to walk further down the street. This Bank Machine is inside their store and pointed out, just goes to show you that you really need to be careful when asking people for help. The receptionist at the Hostel said there was none in the old town and I needed to go the miles back to the bus station to find a Bank Machine. This machine is right down the hill from the Hostel. 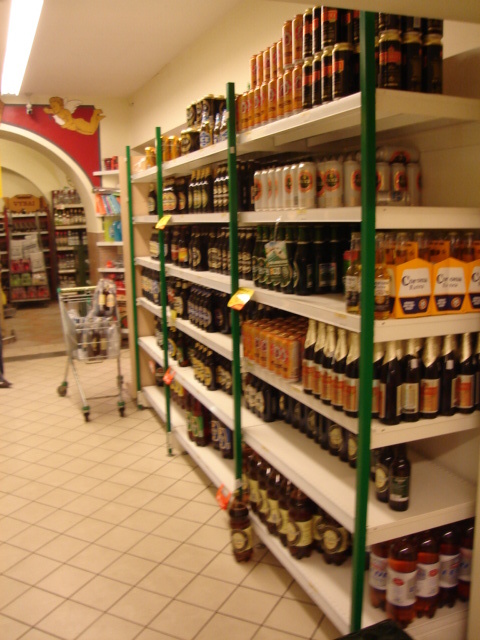 Beer and Alcohol takes up about 20 percent of all store and in the smaller stores a higher percentage.